TheDJBrain is a research, book, coaching and app development project that explores the intersection between the virtues of DJing (i.e. the selection and mixing of music) and the positive psychology concept of "Flow" as defined by Mihaly Csikszentmihalyi. 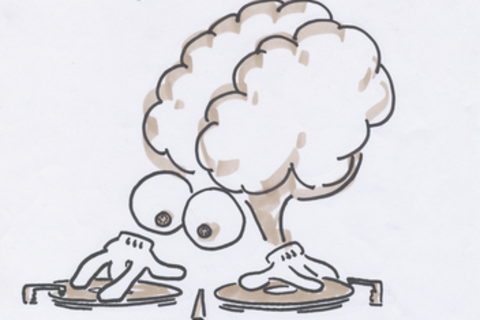 Using cutting-edge neuroscience, TheDJBrain explores how DJing is capable of creating compelling flow experiences that have a positive impact on the creative brain. Experiments involving neuroimaging of DJ experiences and states induced by musical sets from world-class DJs. Develops specific techniques to include DJing modules into personal/business coaching. Plus mapping of DJ skills to a management environment. Will provide a shortcut for 10.000 hours of DJing with an app focusing on facilitating selection, matching and mixing. Wilfried heads the innovation team with great vibrancy. Always thriving to improve journalism’s creative toolset he has worked as an information specialist, freelance print and TV journalist and Online editor before joining DW back in 2002. He’s also a lecturer for “Technical Journalism” and “International Media Studies” at the Bonn-Rhein-Sieg University of Applied Sciences. In his leisure time he’s regularly “spinning a tune”.